Information and transaction app for iOS and Android. Movistar is a leading mobile carrier company in Ecuador. so they needed to improve their communication with the users and give them more self-managing options. I led the User Experience team in charge of research, wireframing, UI design and testing iterations. The previous app was not widely downloaded and costumers didn´t find it as a useful tool to get information about their account or plan, or even to buy additional services. Movistar Mobile App´s design process included stages as: audience research, informations architecture, prototyping, testing, among others. What continues is a description of the highlights of said process to illustrate the applied tools and methodologies. I worked directly with Movistar brand managers and marketing teams to understand the products and services. Identified the unique benefits they offer and how it affects their users. The next step was get to know the audiences, their needs and understand what they wanted to have in an app they would use everyday. Knowing their behaviours and motivations allowed me to inform the first design stages with a clear goal ahead. Defining the content structure for the app is a key stage of the process, in order to support usability and findability. Based on the results of audience research and what the stakeholders needed the app to achieve, I labelled and organized the information acordingly. There were key findings about how to group related content together and the way they are perceived by the user. Ensuring it to be easier to find based on the user's understading of each section. There were many lo-fi prototype design iterations which allowed the team to explore, discover and understand how the information can be delivered and how the user can interact with it. The app was required to not only present immediate data like: service consumption but also allow users to buy additional packages and contact costumer support. User testing was engaged everytime a stage or module was explored as a wireframe, in order to identify any usability problem and fix it in the next iteration. Based on the Brands Guidelines, the team created beautifuly designed interfaces that not only achieved all the functionality goals and delivered information clearly, but also delighted users. From the very first user testing session, the results were overwhelmingly positive. Costumers responded as I expected, finding the information they needed with no effort and completing tasks successfully. 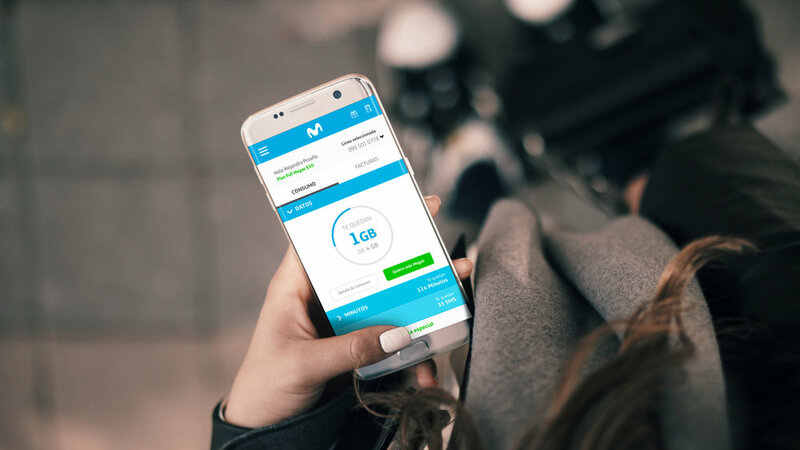 Movistar Mobile App was published and users nationwide were able to download it and start using the new services and functionalities. As the lead UX designer in charge of the project, I believe the final product exceeds both our and the stakeholders expectations. The app is easy to use, intuitive, elegant, and users have adopted it as a must-have app on their devices. I am proud to have planned, coordinated and participated in the different design stages of an app that successfully embodies what the brand is and helps costumers solve problems on a daily basis.